In this painting, you can see the cool morning light shining on a pretty garden scene. The painting was inspired by one of many such scenes that I saw while on the garden tours in Newport, Rhode Island held in June every year. Homeowners on the quaint streets of the historic part of town open up their garden gates to let visitors get a glimpse of their lovely gardens. 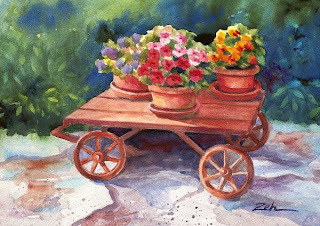 Pink and red impatiens, yellow pansies and violets fill pots on this little garden cart. This painting has been sold. You can see more of my original flower paintings and floral fine art prints in my Etsy shop.